Religion, says Bishop Desmond Tutu in his book, God is Not a Christian: And Other Provocations, “…should foster sisterhood and brotherhood, which should encourage tolerance, respect, compassion, peace, reconciliation, caring and sharing.” To the contrary, however, Tutu notes that religion “…has fueled alienation and conflict, and has exacerbated intolerance and injustice and oppression. 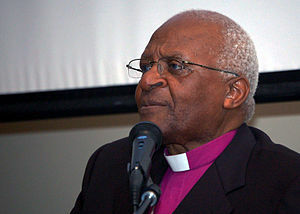 Some of the ghastliest atrocities have happened and are happening in the name of religion,” Tutu writes. Why in the name of all that is good is that true? It sometimes feels that God is absent, or perhaps lounging, watching His/Her children be as completely human as they care to be – meaning, God leaves us to our own devices. In many ways, we are like the Biblical prodigal son, who insulted his father by asking for his inheritance while his father was very much alive. Such an act in Middle Eastern culture was unheard of, and should have driven his father to wild rage, writes Kenneth Bailey in his book, Finding the Lost Cultural Keys to Luke 15. Instead, writes Bailey, the father swallowed his hurt and insult, and granted his son the gift of freedom. He watched …as his son made a horrible decision, alienated his family and community, and went off to be as completely human as he cared to be. In that story, the son “comes to himself,” and decides to go back home, and his father runs to meet him, which prominent men of that day did not do, lifting up his heavy robes exposing his legs so that he could run faster, again, something which was not acceptable for him to do. One did not run; one did not expose his or her legs. This father did both. Stories like that serve as reminders that God is not absent, but that God really does allow us to be free – even if our being free results in oppression and intolerance and unkindness amongst ourselves as squabbling children. It makes me want to say to God, “God, please, can you be a little more strict? Can you please cut down or cut back on this free will thing? Don’t you want a good world?” God allows us, as His/Her children, to take our inheritance of love and go to a “far land.” Yes, we are free! But with our freedom, we are wildly irresponsible, causing so much chaos and pain. Did God ask us to do things like love our enemy, or forgive folks, or …do to others as we would like done to us …knowing that we would never do it? That the way God wired us made it almost impossible? Right now, there is a civil war in Syria – amongst religious people. Some of our lawmakers, like Sen. John McCain, seem to be pushing for our country to become involved militarily – like “boots on ground” involvement – in that country’s civil war. The Syrians are doing horrible things to each other, and some Americans want us to help them do it. Protestants and Catholics fought against each other in Ireland; Christians fought against each other in our own Civil War. In the case of Syria, I wonder if those who are fighting each other stop long enough for traditional prayers. My guess would be that they do. What is it about religion that makes its adherents so incapable of doing what religion is supposed to foster, the things that Bishop Tutu raised in his book? It seems that very few of us “get it.” The new pope, Pope Francis, seems to get it, that as a religious person, are all held to a higher standard. The other day he interacted with a young boy who has Down Syndrome, inviting him to sit in the pope’s seat in the pope-mobile. A small gesture, for sure, but one that made a profound impact on that young boy and probably changed his life. He’ll probably want to be pope one day so that he can pay forward what Pope Francis gave to him. (http://www.huffingtonpost.com/2013/06/19/pope-francis-down-syndrome_n_3465684.html) He has said that “Christianity is incompatible with anti-Semitism,” and says that he is going to work to deepen and improve the relationship between Catholics and Jews. (http://www.religionnews.com/2013/06/24/pope-francis-christianity-is-incompatible-with-anti-semitism/). He is not being a reticent prelate, and his determination to be amongst the people is not going unnoticed. That kind of involvement with “the least of these” would probably help us all be nicer to each other. People have a need to be touched, loved and affirmed. We have God, but we are not all that interested in worshiping Him/Her – if worship means to honor God by following God’s directions. We worship the Bible, wrote the late Rev. Peter Gomes, chaplain at Harvard University; in fact, Gomes said, this “bibliolatry” has superseded our desire and ability to connect with God. Gomes writes in The Good Book: Reading the Bible with Head and Heart,” that “in the absence of a visible God, the temptation is always near to make a god of whatever is visible and related in some proximate way to the real thing.” Perhaps. Or perhaps we make a god of whatever is visible and related to our own ideologies and prejudices. Ideology kicks theology out of the game. So, in the name of an ignored God, the late Osama bin Laden, purported to be a devout Muslim, plans and executes a plan to bomb the World Trade Center towers and the Pentagon, though that part of the plan failed thanks to the brave people on that flight. In the name of an ignored God, churches spew venom against gays and lesbians. In the name of an ignored God, racism, anti-Semitism, and sexism have flourished. So many times the oppression of people and groups have been the worst inside of churches and in spite of a professed belief in God. God allows us to go to a far place …and stay there. Maybe we’d do better with a little less freedom. God does not make any mistakes….God gives us freedom because he trust his children, like so many parents….And when we and others mess up, which was God plan…God is patient for us to learn from our own mistakes and from others! Some children learn very quickly and others take a long time. There are SO many things done in the ‘name of God’ by religious people that truly have God NOWHERE near. It makes me extremely weary of churches and religion and I know I’m not the only one. It is an interesting question that you pose, did God create free will knowing that we were going to ignore his commandments? Who knows, but I sure wish I could sit up with God and have a conversation about those tough questions. All very interesting.